How a thyroid cancer develops? Thyroid cancer is a disease that develops when abnormal cells begin to grow in the thyroid gland. Thyroid gland is a butterfly-shaped gland which is located at the top of the neck and makes the hormones that regulate the way in which the body uses energy and help the body to function normally. Thyroid cancer is a rare form of cancer which is found in early and the treatments usually work well. After the treatment, thyroid cancer can be attributed again sometimes several years after the treatment. What are the causes of thyroid cancer? Many experts do not know the exact cause of thyroid cancer. It is a common fact that people who exposes to a lot of radiation by any way either through medical treatment or through the environment generally gets the greater chances of developing thyroid cancer. X-rays of head, chest and neck especially during childhood can put a person at the risk in which a thyroid cancer can develop. 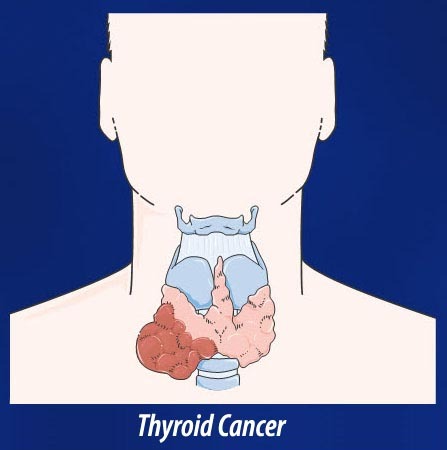 What the symptoms of thyroid cancer? Some people do not show any prominent symptom other than a lump or swelling in neck and doctor easily diagnose the disease by a physical examination. Doctor suggests a biopsy of thyroid gland if he notices any swelling in neck. A biopsy is a procedure in which a small piece of thyroid tissue is removed, with a needle, and checked for any signs of thyroid cancer. Doctor can also remove any lymph nodes in the neck to confirm if the cancer has spread beyond the thyroid or not. There is a rare type of thyroid cancer called medullary thyroid cancer (MTC), that runs in families and a genetic test can confirms the development of thyroid cancer in such cases. Cancer name itself is dangerous. Thyroid cancer is very rare. It starts from thyroid gland and is kind of neck cancer. According to a new study, it has been found that those who stay in volcanic regions, are at higher risk of thyroid cancer. If anyone observes symptoms of it, should consult doctor immediately. How quick can somebody expect to lose weight?